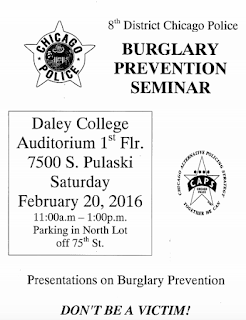 residential and commercial burglaries at a seminar set for 11 a.m. to 1 p.m. Saturday, Feb. 20 at Daley College, 7500 S. Pulaski. The convicts, who are giving the advice as part of their efforts to turn away from crime, are associated with the Safer Foundation’s “Keeping it Real” program. The event, organized by the Chicago Lawn (8th) District CAPS office, will also include advice from a Chicago police detective and an evidence technician. 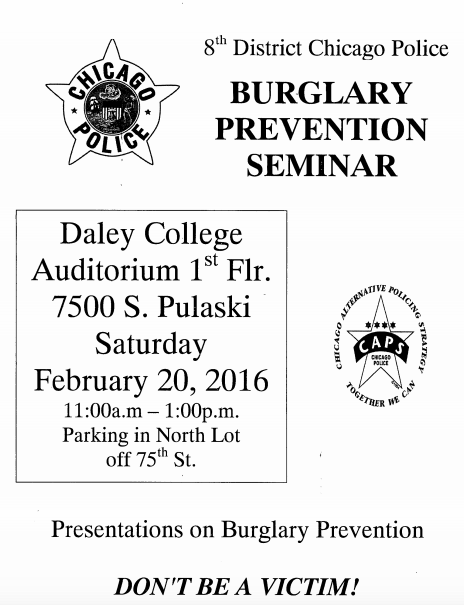 For more information, call (312) 747- 8730 and ask for the CAPS office.